An inadequate crew. Cruise ships are often undermanned. 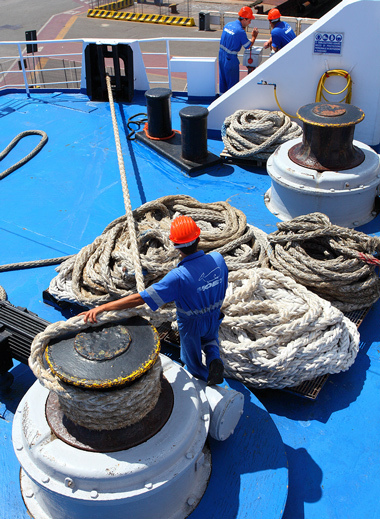 When this occurs, crew members have to work too many hours and do the job of two or three crew members. If a crew member is injured under these circumstances, he has the right to receive money compensation from the cruise line. Failure to enforce common sense guidelines for the lifting, carrying and pushing of heavy items. Because of the constant work pressure on the cruise ships, the cruise ship companies do not enforce common sense rules for the lifting, carrying, and pushing of heavy items. If a crew member is injured because he was forced to lift, carry, or push heavy items, he has the right to receive money compensation from the cruise line. Inadequate Cleaning and Maintenance. Frequently, the stairs and floors of the ships are wet, greasy, dirty and slippery. If a crew member is injured because the floor or the stairs are unsafe, he has the right to receive money compensation from the cruise line. Inadequate Training and Insufficient Hours of Rest. Frequently, crew members do not receive adequate training for the tasks they have to perform, or they are not given enough time to rest between work days. If a crew member is injured because he is not properly trained or because he is exhausted after working too many hours, he has the right to receive money compensation from the cruise line. Insufficient or Defective Equipment. Frequently, the cruise lines fail to maintain the equipment and tools necessary to do the job. They also fail to buy new equipment when the current equipment is broken or defective. If a crew member is injured because he did not have the proper tools to do his job or the equipment he was using was broken or defective, he has the right to receive money compensation from the cruise line. Our advice to any crew member that is injured aboard a cruise ship is to consult with a maritime lawyer immediately because his injuries were probably caused by dangerous or defective conditions aboard the ship. It is generally understood that the captain is the ultimate authority of any vessel, and is expected by the general public to put the well-being of his or her passengers first by being the last to leave a sinking ship. What made the Costa Concordia disaster so infamous was the fact that the ship’s captain, Francesco Schettino, chose to abandon ship and leave his passengers to their own devices. But despite tradition and common practice, international maritime law has no fixed penalty for the cowardly and selfish act of abandoning ship. However, since the vessel was flying the Italian flag and sailing in Italian waters with an Italian captain, the jurisdiction lies under Italian maritime law—which means Captain Schettino can be prosecuted by the Italian government and sent to prison. Abandoning ship is still considered a maritime crime in Greece, Spain, and Italy, in contrast to other nations that have removed it from their books. Where are maritime crimes prosecuted? When incidents occur in international waters, obtaining complete investigations and prosecuting offenders can be difficult, since the efficacy of enforcement depends on the flag state of the ship. Many U.S. Corporation owned cruise ships sail under Panama or the Bahamas, so any incident that involves these ships would be investigated not by the U.S., but by Panama or the Bahamas. In addition, the vessel may be subject to the laws of any country where it docks. Unfortunately, this left little recourse to American passengers who have gone missing or were victims of crimes at sea. As a result, many victims were forced to hire specialty maritime lawyers in Miami, Florida and file civil suits against cruise lines, which left little impact on international maritime law and enforcement. Finally in 2010, the International Cruise Victims Association lobbied Congress, resulting in the ratification of a new law compelling U.S. based cruise lines to report maritime crimes to the FBI. 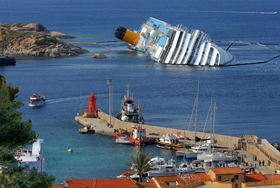 Another concern highlighted by the Concordia disaster is the way modern cruise ships are built. Today, all active vessels are built according to the regulations specified by the Solas (Safety of Life at Sea) conventions, which are created and enforced by sovereign member states of the International Maritime Organization (IMO). All ships sailing through ports belonging to member states are subject to regular surveys and inspections, which should ensure widespread international safety compliance. As they say, hindsight is always 20/20. There are concerns that the large size of the Concordia may have compromised cruise ship safety by making evacuation more prolonged and difficult. However, there were many factors that contributed to the Concordia disaster, such as: Captain Schettino’s questionable decision to sail without first conducting a safety drill; his alleged non-compliance of the established route; his neglect in issuing a mayday signal soon after the accident; his choice to abandon ship without warning the passengers; and his refusal to return to the ship to assist with rescue efforts. According to Nautilus, the maritime professionals’ union, there needs to be a re-evaluation of current cruise ship safety guidelines. With last year’s sinking of the Concordia still fresh in people’s minds, many would-be cruise ship passengers are finding themselves in agreement with that assessment. According to the IMO’s interpretation of maritime law, all cruise ships must carry enough lifeboats for all passengers on board. But enough lifeboats aren’t much help if they are inaccessible during an emergency, as the doomed Concordia passengers found. Standard cruise ship safety regulations aside, it could be said that the biggest danger to a passenger’s well-being are ship and crew personnel that don’t care enough to follow established rules. Captain Schettino was found to be non-compliant of many standard safety procedures, which helped seal the fates of the unlucky passengers of his ship. Fortunately, maritime disasters like the Concordia are extremely rare. While passengers have no control over the skill and conscientiousness of their captain, there are still some measures they can take to ensure their safety. If you are an American citizen who wants to travel internationally, you can register with the Smart Traveler Enrollment Program (STEP) or go through the U.S. Embassy, which will make it easier for the State Department to help you during times of emergency. Before travelling out of the country, it is a good idea to make a copy of your passport and store it electronically on a cloud drive, so you can access it anywhere with an internet connection. Always bring a bag with essentials, such as your prescription medication and toiletries. And once you board the ship, make sure to locate your life vest and attend the muster drill. For everything that went wrong with the Concordia evacuation, it’s important to remember that the vast majority of the ship’s passengers were able to leave the ship safe and sound. Overall, cruise ships are still one of the safest vacation options travelers can choose—and as long as the cruise industry stays vigilant, there’s no reason for another Concordia type accident to happen again any time soon. It was one year ago on January 13, 2012, that the cruise liner Costa Concordia sank off the Italian island of Giglio after accidentally navigating into rocks. There was no warning—the lights simply went out during the magic show, which was quickly followed by sounds of scraping, the ship tipping to one side, and a panicked and disorderly evacuation. The disaster claimed the lives of 32 people, and even now the ship remains submerged in the ocean. The ship’s captain, Francesco Schettino, may be indicted on various charges, including manslaughter, negligence, and abandoning the ship before his passengers. Other Concordia crew members and executives may also face trial, though it will definitely take more time before accountability is fully established. Fortunately, the cruise industry has taken action and reviewed cruise safety policies, enacting changes designed to make cruises safer for both passengers and crew members alike. Since the disaster, cruise ships all over the globe have redoubled their commitment to safety on cruise ships. Nobody wants to repeat the Concordia disaster, which means that routine cruise ship safety measures are no longer taken for granted. Passengers need to pay attention, attend muster drills, and listen to cruise safety instructions. 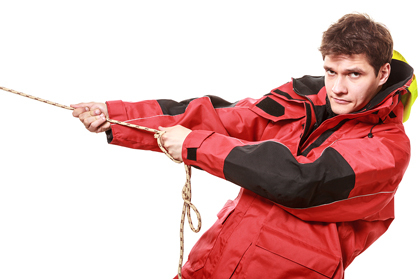 After Concordia, the new muster rule was established—which means that cruise ship safety drills must be completed before sailing. This is especially important, since at least several hundred passengers on the doomed liner had not attended a muster drill. This was cited as one of the biggest factors behind the panicked and disorderly evacuation. In addition, 10 new initiatives have been enacted, which include important cruise safety measures such as: restrictions on bridge access, an increase in available life jackets. Cruise ship passengers can help ensure their own safety by listening to the ship’s crew members Whether it’s the massage therapist, server, or bartender, they are all rigorously trained and knowledgeable when it comes to safety on cruise ships and emergency evacuation procedures. Passengers should not blow off muster drills, since the information being dispensed is always essential during the event of an emergency. Safety standards and regulations have been standardized for cruise lines all over the world after the Cruise Lines International Association (CLIA) was formed at the end of 2012. The organization’s focus is to create and update existing cruise ship safety regulations for the cruise industry, in order to ensure a safe traveling experience for everyone involved. The Centers for Disease Control and Prevention (CDC) and the U.S. Coast Guard also play an important part in regulating cruise safety, since these organizations conduct safety inspections and ensure compliance with the International Convention for the Safety of Life at Sea. Passengers looking for more information regarding cruise safety records can access CDC reports posted on the CDC web site, or read the Coast Guard incident reports on the U.S. Coast Guard web site. An important consideration for ensuring passenger safety is for the traveler to practice good hygiene. As always, frequent hand washing with soap and hot water is one of the best defenses against illness. If hand washing is not always possible, infrequent use of over the counter hand sanitizers may be the next best thing (overuse can inadvertently create resistant bacteria). It can’t be emphasized enough that a little preparedness can go a long way to ensuring a safe and fun vacation. Travelers looking to prevent seasickness would do well to pack ginger candies, Dramamine, and acupressure wristbands into their luggage before boarding the ship. Health forms should be answered honestly, so the crew can take the proper precautions to ensure the health of all boarded passengers. While there’s no way to undo the Concordia disaster, much can be done to prevent a similar tragedy from happening again. As long as the cruise industry is vigilant and passengers are active participants when it comes to ensuring their own safety, a cruise trip will continue to be one of the safest vacation options a traveler can choose today.